Draw the mosaic tile design pattern on the mosaic base. The mosaic pattern can be a freehand drawing, geometrical pattern or drawing adapted from another work of art. Draw the pattern on the base with a pencil first, then make any revisions and trace over the pencil with a felt-tip pen. Unless you will trim the tiles into smaller pieces, keep the pattern design open and avoid areas with small details. Separate the mosaic tiles by color prior to arranging them in the pattern. Lay the tile pieces face-up on top of the base, using the pattern as a guideline. Re-arrange the tiles and substitute tile colors until you achieve the desired mosaic pattern layout. Do not use any glue yet. Trim the tiles with tile nippers to ensure alignment within the mosaic pattern. Wear safety glasses while cutting mosaic tiles to protect yourself from stray tile shards and splinters. Glue tile pieces to the base, using mosaic tile adhesive and a spatula. Apply enough adhesive to cover the base of each. When pressed into place on the mosaic base, you should see a small amount of glue around the base of each tile piece. Trim tiles as needed, using the tile nippers when fitting and gluing the mosaic tile pieces into place. Press tile pieces firmly in place, leaving approximately 1/8 inch of space between the tile pieces. Repeat with additional tiles until mosaic pattern is complete. Let adhesive cure for 24 hours in a well-ventilated area to avoid excessive exposure to the adhesive chemicals. Open windows and doors, turn on ceiling fans or put fans in doorways to ensure air flow through the work area. Apply sanded mosaic grout to the gaps in between the mosaic tiles using a spatula. Fill the gaps completely to prevent air bubbles in the grout and to cover sharp edges of the mosaic tiles. Remove any excess grout from the mosaic tile surfaces using a dry paper towel. Do not remove any grout from between the mosaic tiles that could expose sharp tile edges and corners. Allow grout to dry for 30 minutes in a well-ventilated area. Remove any remaining grout from the mosaic tile surfaces using a damp sponge. Avoid adding additional moisture to the grout; grout can crack as it dries if it was too wet. Allow the grout to cure for 24 hours. 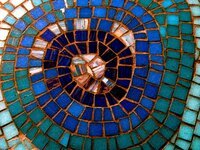 Bases that work well for beginning mosaic tiles are unfinished ceramic tiles, wooden serving trays and simple mirror or art frames. Use mosaic tiles that have the same height to ensure an even surface on the finished mosaic. Use safety glasses when cutting mosaic tiles. Work in a well-ventilated area when applying the mosaic tile adhesive and grout.